In this episode of the Daily Carrot, Justin will reinforce your understanding of Straight Line Depreciation, a key concept covered in the Engineering Economics portion of the Engineer In Training Exam. 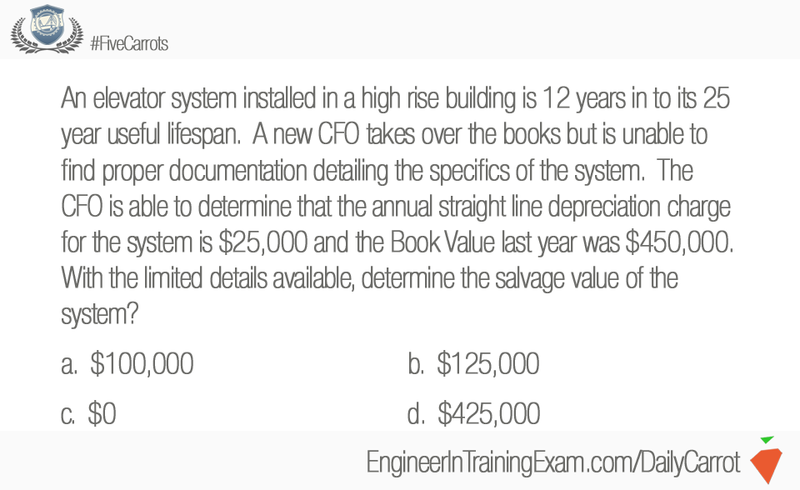 Engineering Economics is a critical concept that will be encountered on the Engineer in Training Exam. Even if you are just graduating as a Senior, some of the topics are far removed from the memory banks, having taken them as far back as your Junior year. If you have been out of school for some time, the challenges are even greater. This Daily Carrot will be honing in deep on Straight Line Depreciation by working through an example. Most important, you will get #FiveCarrots, my commitment to YOU! Daily.